I’ve been doing a lot of skiing lately so this video seemed particularly poignant and funny. This guy clearly didn’t know how to use the rope tow at Alta. This one is for you Rosie. Hopefully it’ll make you laugh. Over the next two days some areas of Colorado Rockies are expecting up to eight feet of snow. Avalanche danger is already high and expected to get much worse. Be careful out there folks. Being caught in an avalanche is like being buried in cement. You can’t dig yourself out of an avalanche. When buried, you can’t even move. Even if you could move, which you can’t, you wouldn’t know which way is up. And although it may be cold being buried in the snow it is actually suffocation that kills you. Your only chance of survival is if your friends (you are with friends right?) dig you out. 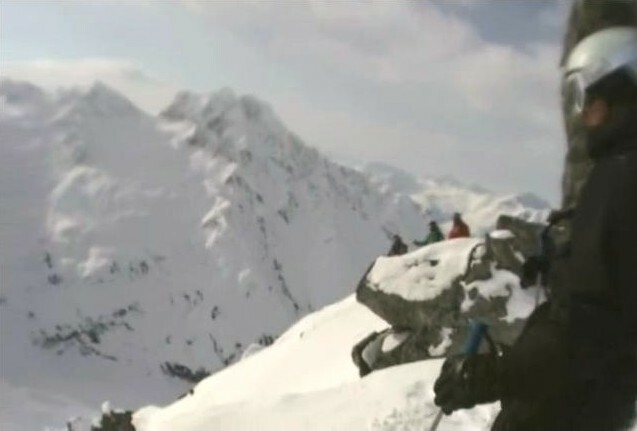 The first person video below gives you an idea of what it might be like to be caught in an avalanche, and being rescued. The scratching/ruffling back-and-forth sound you hear is his chest rising and falling and the noise that his jacket makes. You can actually hear his breathing become stressed and accelerate, even in the short amount of time he was buried. The intermittent whimpering noise you hear is him trying to swallow and get some air. He was only buried for 4 and a half minutes which is incredibly short. I cannot stress these next sentences enough; that in and of itself to be unburied in ONLY 4:28 is miraculous if you have any understanding of being caught in an avalanche and what it takes to be found. It could literally be some kind of “world record” just on how good the guide and supporting cast of other skiers was in getting to him. Have some fun out there but respect nature. As an avid skier I have always considered moguls to be large, immovable, obstacles. Solid piles of difficulty that haphazardly push my skis around with no regard for my intentions. 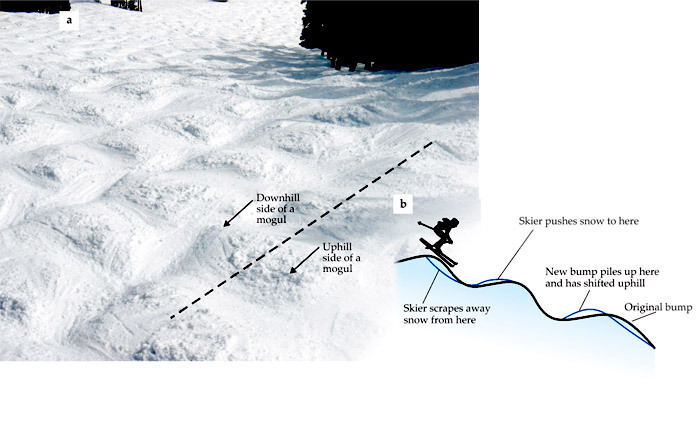 Three researchers in Colorado, David B. Bahr, W. Tad Pfeffer, and Raymond C. Browning, have discovered that moguls actually move! And not only that – they move up hill! A specific representation for the erosion–deposition wave W at position x created by a skier n may be given by the sinusoidal form Wn(x) = a sin(2πx/2rn + ϕn), with positive W corresponding to deposition. The layman explanation goes something like this: as a skier turns on a mogul, snow is scraped from the bottom of one mogul to the top of the next one, having the overall effect of “moving” the moguls. And, although skiers invariably push snow down the mountain, the ski moguls move uphill. Below is a time-lapse photo of video showing the uphill migration of ski moguls on the Riflesight Notch ski run at Winter Park Ski Resort. The movie spans five months, starting in early December and ending in late April of the 2006/2007 ski season. Each frame of the movie represents one day. Last week I went to my friend Josh’s art opening. He was showing lots of new stuff that followed a similar vein as his last showing, but using some new mediums including willow and steal, and taking a more architectural bent. I recommend you go check it out if you have a chance. The showing is currently held at the Icelantic Gallery. If you haven’t yet heard of Icelantic, they’re a local Denver company making some really cool, short production, skis. All their models have some incredible graphics (by Travis Parr), and from what I understand, a pretty sweet ride. Last Sunday probably wasn’t the last day of the ski season for me. Arapahoe Basin will most likey be open long into the spring (I once skied A-Basin on the 4th of July) and I’m sure I’ll get one last day in there. But Sunday was was the last day to ski for free on our passes. Mary Jane was much more crowded than we expected. The last two weekends have been practically empty but it seems, this time around, everyone had the same idea as us and it ended up being a lot of fun. The entire place was a giant party/cookout/ski fest. There were at least three bands in the parking lot – a punk band that drew all the young snowboarders, an “old persons band” that rocked out the classics like America’s Sister Golden Hair (One of my many favorite songs from the 70’s), and an acoustic duo that was barely audible above all the party goers. The entire day was a blast and the whole mountain was going off. We had bluebird skies and weather in the 60’s. We had hot dogs, beer, and a grill. We had enough snow that the chutes were open (see the photo above) and the skiing was nice and heavy and mash-potato-ey at the bottom. Lots of people were dressed up in costumes or bikinis. It was probably one of the more fun days in what was one of the better ski seasons of my life.